[I] liked it! A lot! It works well chronologically, though I'd argue you should restore the seconds with the poisoning. The cut is a tad abrupt, what with the can in focus and all. As for the rest of it, you've managed, in my eyes, to improve the movie. 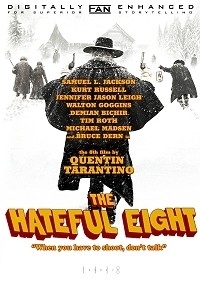 My fervor for Tarantino has cooled over the years and H8 & Django I consider to be his lesser works. With this edit H8 became considerably better. And [...] the pace is good throughout. Otherwise the editing is exquisite, visually and aurally. The only thing I didn't like was the very end. The new music is all good, but Mannix reading the letter works quite well in the original. I'd end it after his delivery instead of fading it out with end titles on picture. But that's just me. I still agree with all the above. The editing is indeed flawless and whatever small glitches found seems to have been dealt with. The removal of the narration is a blessing, and except the coffee pot and letter reading-cuts mentioned above, I didn't miss any of the other bits removed. I would, however, recommend that one sees the original first. Otherwise, the tension that thecuddlyninja also mentions in his review will be ruined. A stellar edit, highly recommended!